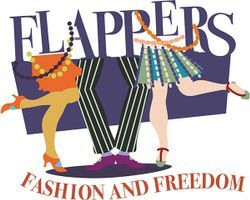 In this key moment in our national history and the struggle for women's equality and freedom of expression, the Fairfield Museum's exhibition "Flappers: Fashion and Freedom," examines the history and social impact of fashion and its relationship to the women's movement of the 1920s. On the heels of World War I and the winning of suffrage, a rise of consumer culture included mass-produced images from movies, advertisements, and magazines in a way that had never before shaped an era of American womanhood. Drawing on the Fairfield Museum's rich costume collection, this exhibition raises questions about the relationships between the "New Woman", and the representations of freedom of movement, behavior, and thought that defined modern American womanhood and the "Flapper" culture and lifestyle.